(Pictured is the 8 Note diatonic set!) This set is the 7 note extension kit which expands your 13 note set upwards and downwards. 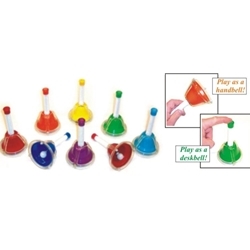 Included are Low A, Low A#, Low B, High C#, High D, High D# and High E. KidsPlay Handbell/Deskbell combination sets conveniently combine the features of both the KidsPlay handbells and deskbells into one handy and versatile product. These sets feature the same bright colors and correct intonation as all KidsPlay bell products. The special mechanism not only allows the bells to be played either by pushing the button or by hand ringin, but also helps to reduce the "double ringing" effect when playing melodies. In addition, when using the chord playing (tremolol) method, this mechanism can help to soften the volume which is helpful when multiple bells are ringing at the same time.